Supper simmers while you put your feet up! 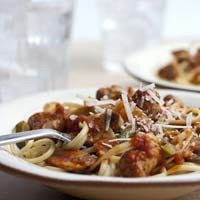 Spicy sausage skillet simmers with veggies and snazzy Pace® to serve over linguine. Heat the oil in a 10-inch skillet over medium-high heat. Add the garlic, sausages and Italian seasoning. Cook until the sausages are well browned and cooked through. Stir the picante sauce, peppers, onion and mushrooms in the skillet. Heat to a boil. Cover the skillet. Reduce the heat to low. Cook for 25 minutes or until the vegetables are tender. Serve over the linguine and sprinkle with the cheese. This entry was posted on 10:12 PM and is filed under Pork . You can follow any responses to this entry through the RSS 2.0 feed. You can leave a response, or trackback from your own site.